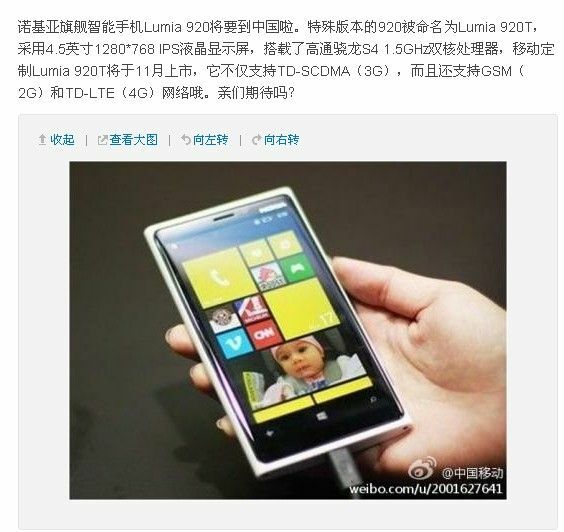 Rumors of a custom model of Nokia’s Lumia 920 smartphone designed to work on China Mobile’s 3G and upcoming 4G networks leaked out last week, but the device’s existence appears to have been (temporarily) confirmed by the carrier. I say temporarily because China Mobile posted a microblog message to Sina Weibo teasing the Lumia 920T as coming next month, but it quickly deleted the message, though not before it got picked up by Chinese bloggers. The deleted message reportedly said the device would sport a 4.5-inch 1280 by 768 screen with the Snapdragon quad-core 1.5GHz processor, so the same main specs as the US version of the Lumia 920 that was announced in September. 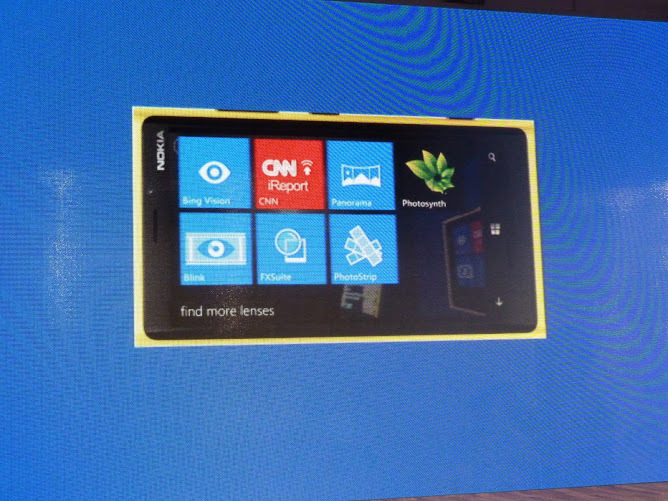 The Lumia 920 is selling for $149.99 on contract with AT&T in the US. The key difference is that the Lumia 920T will include support for TD-SCDMA, which is China Mobile’s special 3G standard, as well as TD-LTE, the protocol that the operator is using for its 4G network. Nokia had an embarrassing gaffe on its hands with the Lumia 920 after it was discovered that demo shots that supposedly represented its image stabilization features were actually filmed on a DSLR. The incident prompted an investigation from the company’s ethics officer. Previously the undisputed leader of the mobile industry, Nokia has fallen on hard times. The company recently announced plans to offer a senior convertible bond note in hopes of improving liquidity. Nokia lost $754 million last quarter and sold just 2.9 million Lumia phones, down 1.1 million sequentially. As such, the company’s continued partnership with China Mobile is vital to its comeback. With nearly 700 million subscribers, the carrier is worth pursuing on numbers alone, but Nokia also has an added benefit that it doesn’t yet have to compete against Apple’s iPhone on the network. Apple’s iPhone 5 is expected to arrive on rivals China Unicom and China Telecom soon, but cooperation with China Mobile still appears to be a ways out. China Mobile currently boast more than 75 million 3G customers, so if Nokia’s Lumia 920T succeeeds in capturing sales from even a fraction of those, it will represent a significant portion of the company’s sales volume as compared to recent quarters. Interest in Windows Phone has been on the rise among consumers in China, and the growing number of Chinese-language Windows rumor blogs and microblogs attests to that fact. Though its market share has eroded quickly in the face of competition from Android and Apple, Nokia should still have remnants of brand loyalty among the country’s consumers that it can tap into with a fresh device. Nokia should also get some help in China from its partner Microsoft. The Windows maker just launched its online store in the country to promote its Surface tablet, while also marketing its Windows Phone platform. Meanwhile, back in the US, Microsoft is gearing up for a big launch of its Windows Phone 8 platform on October 29th. It’s going to a busy day, though, as Google has also scheduled its own event to announce new Android devices on the same day.